Destination: Wetherby Road, Harrogate, North Yorks, HG2 7SA. 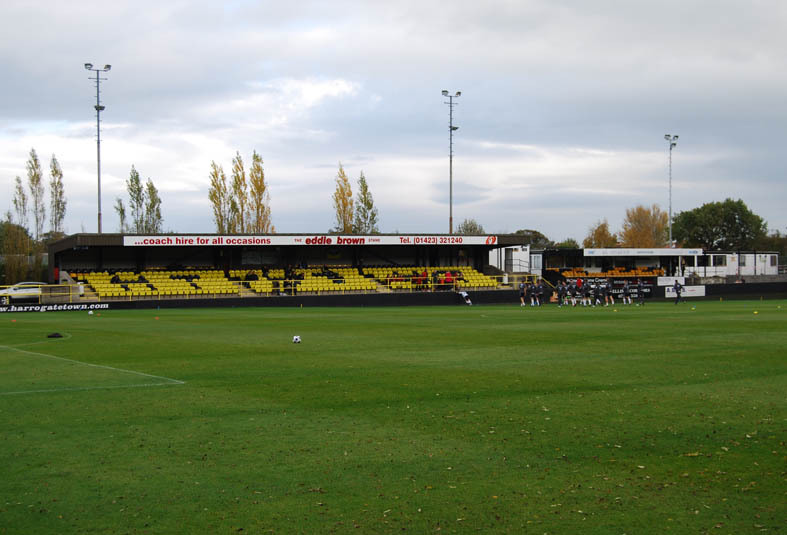 Off The Pitch: In its previous guise as Harrogate FC, Harrogate Town first played at the Wetherby Road ground in 1920, at which point it was little more than an open plot of land. 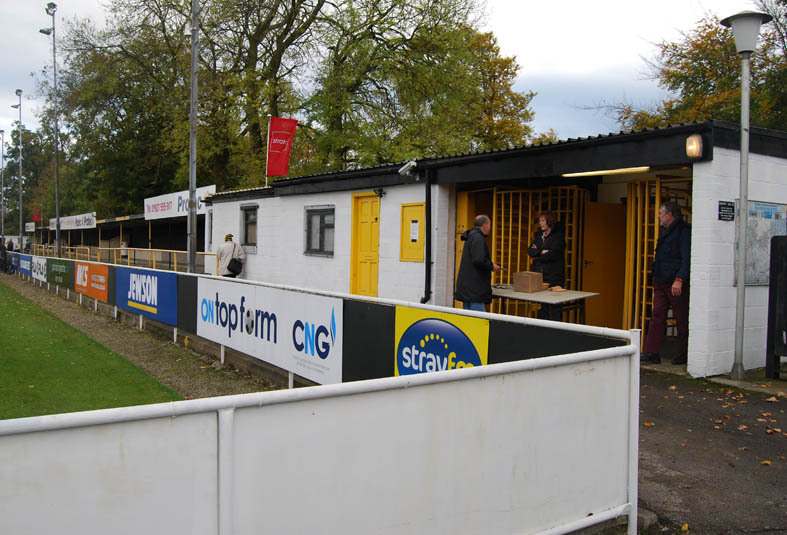 The major developments then came more recently in the 1990s, with the installation of the impressive cantilevered Main Stand (as shown below), and addition of cover to the terracing on the opposite side, with a directors/sponsors lounge also added around the same time. 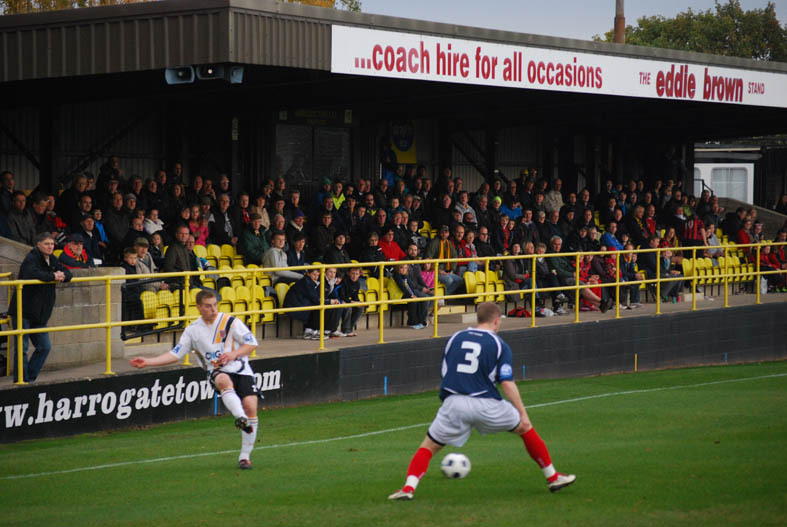 The current capacity is a little over 3,000, with seating accommodation for around 500 spectators and covered standing for just shy of 1,000, making it one of the most well-equipped non-league grounds in the region. 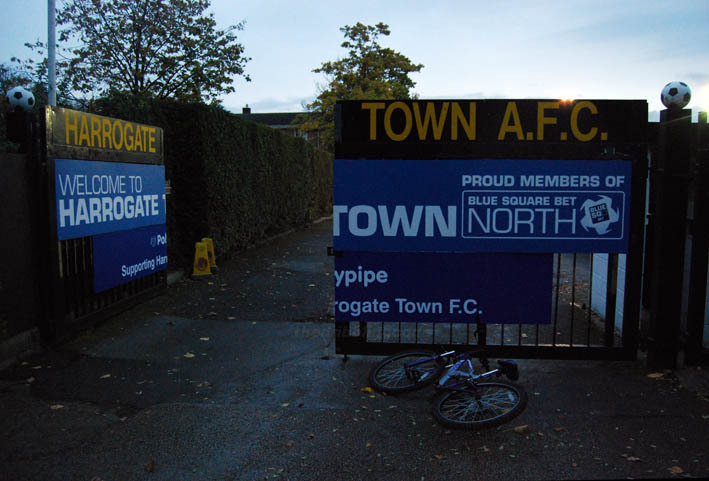 Just inside the ground was a friendly lady selling programmes and welcoming the local supporters, who I sensed a slight air of trepidation from at the moment – some dodgy results and a growing injury list have meant that all has not been smooth on the good ship Harrogate of late. After handing over my two quid for pre-match reading material, I was happy to discover that Town do not follow the “Let’s charge more cos it’s step 2, but still do a bog standard programme+hope no-one notices” trend. Indeed this was one of the better publications I’ve come across outside the Football League, so full marks to Harrogate on this score. Down the side of the ground by the entrance is some stepped terracing, which is partially covered towards the back (left hand side of pic below). With what looked suspiciously like a cabin selling hot refreshments beyond it, it was no surprise that all the locals seemed to be heading that way round the ground, so I did likewise. After picking up a teamsheet, and pausing to collect a brew from the tea hut, I made my way over to the the fromt row of the Main Stand to sort mesen out. Just as I sat down though, a wayward practice shot scuttled along the entire length of the concrete support below the first row seats, skittling tea cups as it went, including that belonging to yours truly. 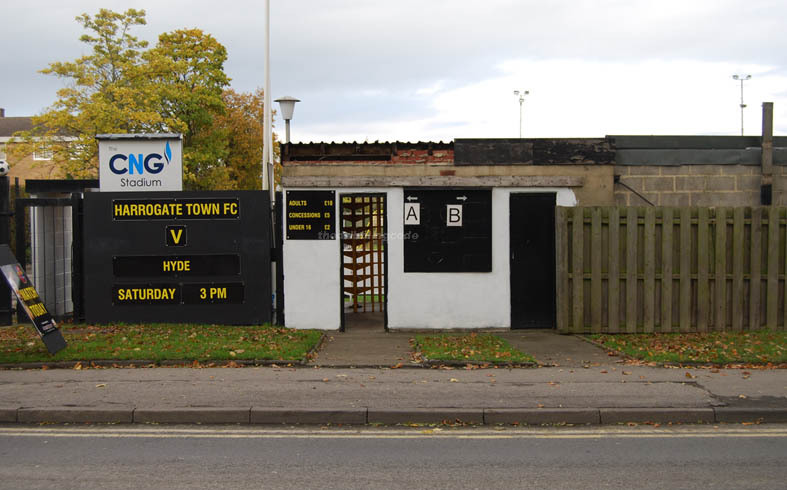 Having survived the Parkgate firing range, I was unprepared at such a seemingly trouble-free location, but such are the perils of non-league football if your reactions are suffering from a ‘late one’ the night before. At least there was no alcohol involved in the mishap, but do watch out should you find yourself in Harrogate’s deceptively safe-looking structure in similar circumstances. Hmphh. 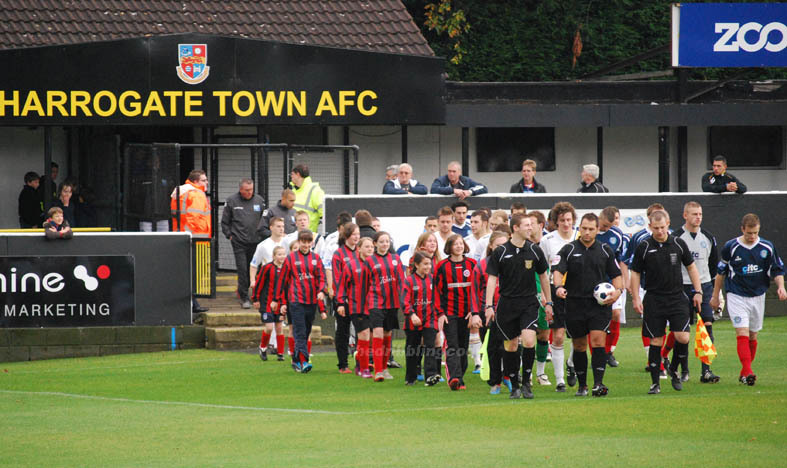 Depriving people of liquid refreshment notwithstanding, Town seem to be a club which is keen to play its part in the local community, as displayed by some of the initiatives mentioned in the programme, and also via the local girls’ team which was paraded with the players just before kick-off. 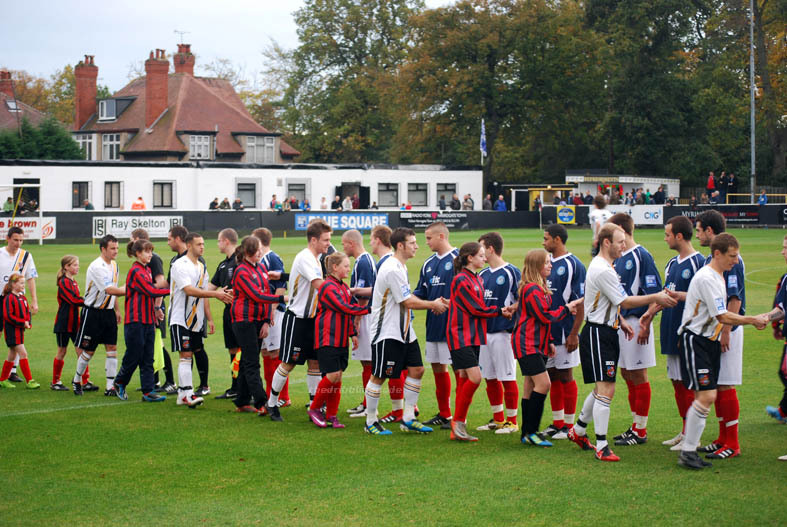 It was a nice touch to have them take part in the handshakes too, and they seemed to be loving every minute of it. 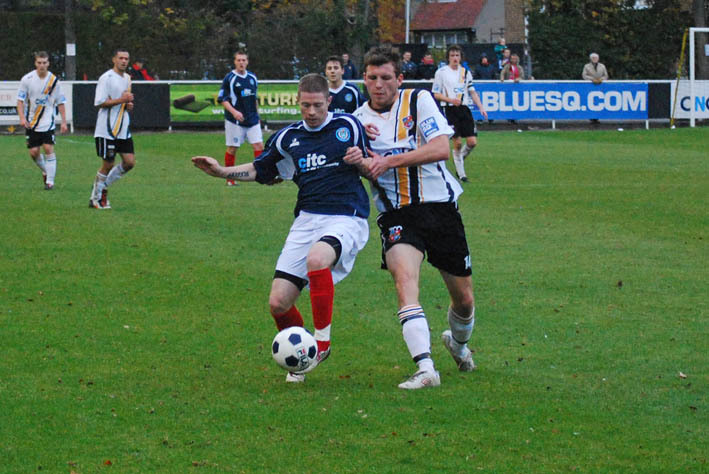 It later transpired that the home side could probably have done with having one or two of them on the pitch as well. Which brings us on to.. 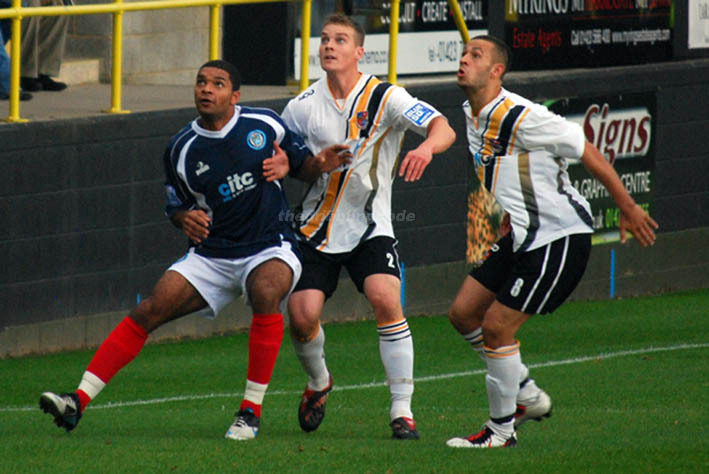 The home side were still very much in the game though, when around half an hour in, they had one of Ron Manager’s ‘stone bonker’ penalties turned down by the ref and linesman – who both appeared to miss a blatant case of manhandling, that every home fan behind the goal and this impartial observer were all adamant they saw. Thus, what could have been a psychological turning point in the proceedings went in Hyde’s favour, and from here on in they asserted their superiority, going two goals up following an embarrassingly easy chance they were allowed to fashion on the 55-minute mark. As the ball broke to the right edge of the box following a corner from the left, Danny Hall was allowed time to light his pipe and adjust his clothing to a jaunty angle, before dispatching a quality finish with the outside of his boot that sailed just inside the far post with Zac Jones again a helpless spectator. Hyde then rounded things off soon after, courtesy of another move down the left wing, where a decent cross led to a free header at the far post for Gianluca Havern, which he made no mistake with getting on target. With the game now all but over, Harrogate made a trio of substitutions and applied some late pressure, but any half-chances they created then went begging due to insufficient shooting-boot quality, which saw a free kick in an ideal position skied clumsily over the bar, and a couple of wayward shots from open play round the edge of the box also amount to nowt. I’m not familiar with the current Harrogate Town side, but from reading the programme notes, they appear to have some would-be-key players out at the moment. Hyde certainly looked to have both a physical and footballing edge this afternoon, with Town’s competitive qualities not enough on the day to match up to their opponents in certain other key areas. Whatever it is, Town are missing that extra something at the moment that could turn their season from one which will have them increasingly looking over their shoulder at the teams below them, into pushing for what I would assume they feel is an attainable play-off spot. 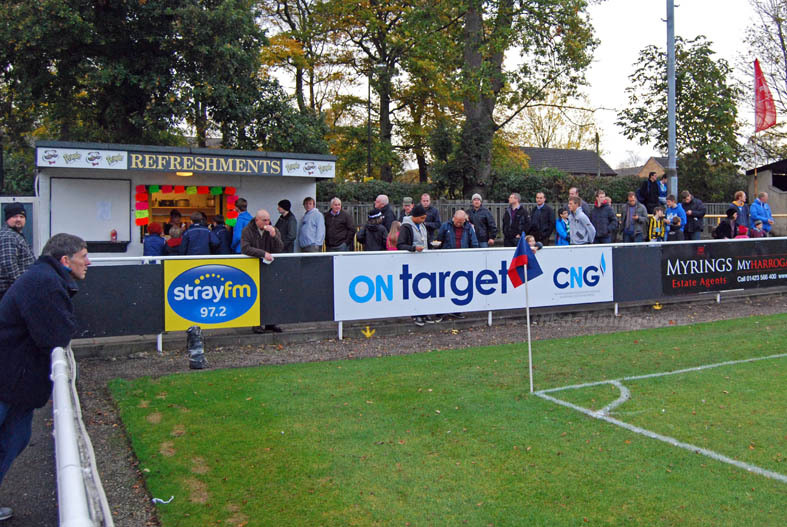 One of the distinctive features of Harrogate’s Wetherby Road ground is the two-way slope which converges on one corner of the ground. By following the brickwork below the stand, you can probably get an idea of how pronounced the ‘drop’ is in this part of the pitch. 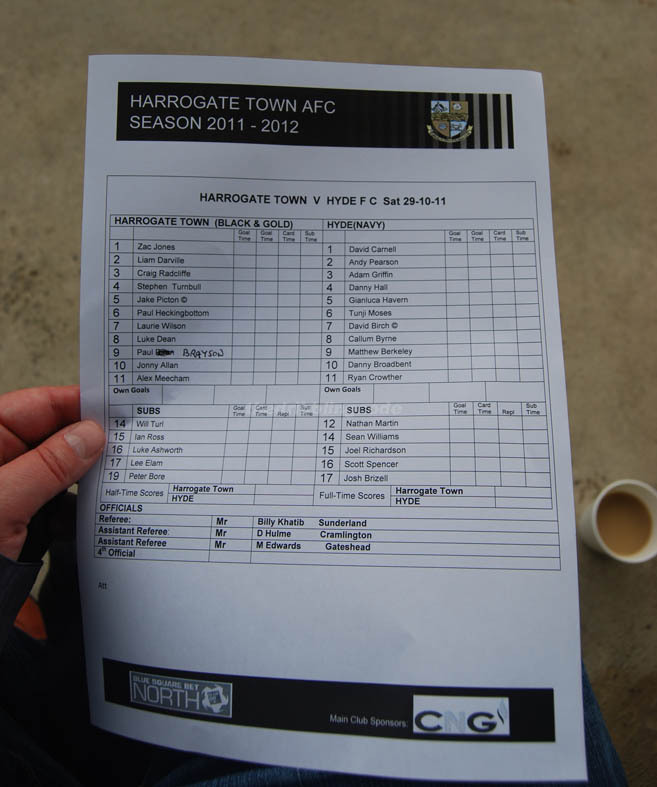 This entry was posted in A-Z by club (home team), Harrogate Town. Bookmark the permalink.